The term "salmon" is used to refer to freshwater fish. All 'anadromous' fish are born in fresh water streams and rivers and then migrate to the ocean where they spend much of their adult life. They return to the rivers and streams to reproduce and die in here. In the United States, six salmon types are more common –Chinook, Atlantic, Coho, Chum, Sockeye, Pink, and Sockeye Salmon. Atlantic salmon is farm raised, whereas Pink, Coho, Chum, Chinook, and Sockeye are harvested from wild fisheries mainly in the Pacific Ocean. Salmon is quite popular in the U.S., but is it good for you? Yes, salmon is good. You can improve your health by eating 2-3 servings of fish a week. Salmon is the best choice here because it is the most nutritious types of fish and provides you with zinc, iron, vitamin B12, and vitamin B6. Salmon is extremely beneficial for you and improves your overall health by loading your body up with some essential nutrients. Here is more about the nutrition benefits of salmon. Your body needs selenium to keep your thyroid functioning properly. This helps improve your immune system and even works as an antioxidant to eliminate free radicals from your body to prevent several ailments. The recommended daily intake of selenium is 55micrograms and a 3-ounce serving of pink salmon provides you with about 44 micrograms. Together with calcium, phosphorous helps build and maintain teeth and bones. It also improves the function of your heart, kidneys, and nerves. The recommended daily intake of phosphorus is 700mg, whereas a 3-ounce serving of wild Atlantic salmon provides you with 218mg of phosphorus. The same serving of Coho salmon has 253mg of phosphorus, whereas the same serving of pink salmon provides you with 286mg of this mineral. Is salmon good for you? Yes with its potassium content. You need at least 4,700mg of potassium a day to help your heartbeat normal and support your muscles. It is equally important for a strong skeleton and healthy digestion. You can get 300mg of potassium by consuming a patty made with 3 ounces of pink salmon. You need protein to build and retain muscles. Salmon provides you with a good amount of protein, but it usually depends on the type of fish you choose. You get 21.6g of protein from a 3-ounce serving of wild Atlantic salmon, whereas the same serving of Coho salmon contains 23.3g of protein. A 3-ounce serving of chum salmon has 22g of protein, while the same serving of Chinook salmon contains 21.9g of protein. Salmon contains healthy, unsaturated fats that promote heart health. It contains both monounsaturated fats and polyunsaturated fats that help ease inflammation and regulate your heartbeat as well. By lowering inflammation, it protects you from several chronic illnesses including cancer. You get about 4.9g of unsaturated fat from a 3-ounce serving of wild Atlantic salmon, whereas the same serving of Coho salmon has 4.4g of fats. The same portion of sockeye salmon has 2.5g of unsaturated fats, whereas farmed Atlantic salmon has 7.4g of fats in 3 ounces. Is salmon good for you? Yes, it is and the presence of omega-3 fatty acids is one big reason why you need to include salmon in your diet. It improves your cardiovascular health by protecting your blood vessels from damage. It also reduces blood pressure, lowers triglycerides, and prevents blood clots. 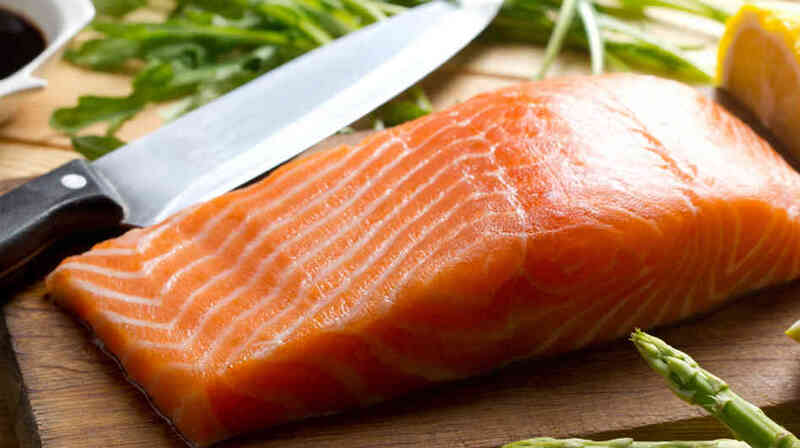 Switching from red meat to salmon will help lower cholesterol that protects you from heart attack. You need to improve your vitamin D intake for overall health. You will be at a greater risk of developing cardiovascular disease, cancer, rheumatoid arthritis, multiple sclerosis, and type-1 diabetes if you do not eat enough of this vitamin. The good thing is that a can of salmon provides you with your recommended daily intake of vitamin D.
Is salmon good for your eyes? Yes, including salmon in your diet will help prevent age-related macular degeneration. It also helps cure dry eye syndrome. Omega-3s in salmon encourage the drainage of intraocular fluid from your eyes and reduce the risk of high eye pressure and glaucoma. Eating salmon increases your omega-3 intake and this plays a role in improving memory and cognitive function. The presence of vitamin D, vitamin A, and selenium makes salmon beneficial for your nervous system. Regular consumption prevents age-related nervous system damage. Some studies have confirmed that omega-3s may help treat and prevent Parkinson's and Alzheimer's disease. Are Pears Good for You?